Registration is now underway for the upcoming SAG Conference, taking place September 22 – 26, 2019 in Vancouver, B.C. For pricing information along with cancellation policy and registration terms and conditions, read the details below. The discount code for accepted primary authors have been sent via email (if not received, check Junk Mail folder). Please use this code during registration to access discounted author price. Payment for all registrations must be received in full prior to the Conference. If you intend to pay by purchase order, it must be authorized by SAG Conference Award Foundation in advance. Attendee substitutions are permitted without charge. Cancellations must be made in writing or by email from the same address used to make the registration. Cancellations will be refunded in full up to Wednesday, July 31st, 2019 when thereafter cancellations will incur a fee of $150. No refunds will be made for cancellations made after Wednesday, September 25th, 2019. If the Event cannot take place as scheduled for reasons of Force Majeure, then the Organizer reserves the right to reschedule the Event to a date and place of its choosing. SAG Conference Award Foundation disclaims responsibility for any travel costs, change fees or any other expenses incurred by customers as a result of Force Majeure. SAG Conference Award Foundation may request a business card and photo ID prior to admission and reserves the right to refuse entry or remove anyone from the event. While we endeavour to deliver the conference program as published, SAG Conference Award Foundation reserves the right to make any changes it deems fit to the conference program. Occasionally speakers may cancel and/or topics may change and no guarantee is given that any given speaker or topic in the program will take place. We accept no liability for the accuracy of our published program. SAG Conference Award Foundation reserves the right to use photographs of any event attendee in promotional materials. 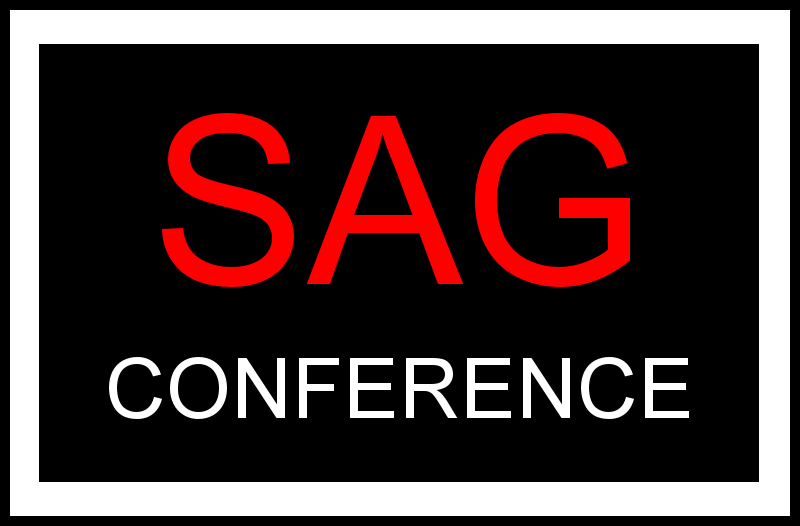 SAG Conference Award Foundation assumes no liability for the acts of its suppliers nor for the safety of any event participant while traveling to or from this event. We also assume no liability for the views expressed by delegates, speakers, sponsors, or anyone else at the Conference. All advice given or materials provided during the Conference are used at the sole risk of the delegate or end user, and SAG Conference Award Foundation assumes no liability for what you do with the information obtained at the Conference. The total liability of SAG Conference Award Foundation will be limited to a refund of the delegate fee. Audio/Video Recording policy: Delegates are welcome to photograph and record sessions for their own personal use. Presenting authors are welcome to photograph and record their presentation for any purpose including publishing online. Delegates attending the sessions consent to appearing in such recordings. All parties, including delegates, speakers, suppliers, and sponsors, are responsible for their own travel and accommodation, including arranging Canadian Visas to attend the Conference. An invitation letter will be provided by the Conference after a delegate registration has been received and paid in full. Severability: if any of the above is or becomes unenforceable or invalid, then the remaining terms and conditions will continue to be valid and applicable.